The Department of State Services (DSS) have claimed that five Fulani herdsmen were abducted, killed and buried in a mass grave by members of Indigenous People of Biafra (IPOB), in Abia state a few days ago. They have also claimed that there were up to fifty more bodies in that mass grave, and that they are all Fulani. The implications of this announcement is obvious. It will create more tension and fear in the land and lead to reprisal killings in the North. Violence is never the way out and I have always believed that it has no place in any civilised society. Yet, what I find curious about this announcement is the fact that it is unique and historic. I say this because thousands of Igbos, Yorubas, Niger-Deltans and Middle Belters have been killed by Fulani militants and herdsmen over the last ten months since President Buhari came to power, yet the DSS has never announced it and told the country about the details and ethnic identities of the victims. When one thousand Shiite Muslims were slaughtered in Zaria and buried in mass graves, the DSS did not speak. When five hundred Idomas were massacred in Agatu by Fulani militants, the DSS did not speak. When hundreds of Southern and Middle Belt farms were raided by AK-47-wielding Fulani herdsmen who murdered, raped, burnt down and took over the land of their victims, the DSS never gave us details of the victims or made any announcement. When our leaders in the South were kidnapped and when men witnessed their wives and children being raped and butchered by the Fulani militias before their very eyes, the DSS made no announcements. When the International Terror Index told the world that the Fulani militias in Nigeria are the “fourth most deadly terror organisation in the world”, the DSS said nothing and neither did they give us details about their activities nor their victims. Worse of all is the fact that our government and our President, who himself happens to be a Fulani, have never deemed it fit or necessary to condemn the activities of the Fulani herdsmen and militants, and neither have they expressed any sympathy or displayed any empathy for their many victims. Let me be clear: the murder of anyone, regardless of their ethnicity or faith, is unacceptable to me. I deplore murder and violence, and in my view the killing of one innocent soul diminishes the humanity of every single one of us as a community and nation. However, it seems curious that the minute Fulanis are killed in the East, the DSS is quick to rise to the occasion and express concern about it, whilst they do not express the same concern when Nigerians from other ethnic nationalities are killed by the Fulani in their own homes and land. Is it not obvious and logical that when the security agencies refuse to protect the citizens from the murderous hordes and herdsmen from hell, those citizens will eventually seek to protect themselves and go on the offensive? That is human nature and it is to be expected. Therein lies the double standard and it is sad and unfortunate. Furthermore, not only is it very dangerous but it also confirms the view that our government and security agencies are not only partial but that they are also attempting to implement an ethnic and religious agenda. And third, why do the government and security agencies have so much hatred and contempt for those that the Fulani regularly target and their victims, and why do they believe that those victims do not deserve to enjoy the full protection of the Nigerian Federal Government? Could it be because they are regarded as slaves and second class citizens? Is Fulani blood and are Fulani lives more important than others? Indeed do non-Fulani lives matter in President Buhari’s Nigeria? Are we compelled to begin a “non-Fulani lives matter” movement which is based and fashioned on the “Black Lives Matter” movement in the United States of America before we can draw the attention of the world to what is going on in our country? Is it so difficult to accept the fact that no government and no force from hell or on earth can compel or intimidate a man into lying down passively and silently watching his family, loved ones and kinsmen being butchered and slaughtered morning, day and night without trying to protect them and without indulging in some form of retaliation? With the sort of things that are going on in our country today, it is time to tell ourselves some home-truths. No-one wishes to accept it let alone say it but sadly war will come to Nigeria again within the next few years. I do not want war and I consider it to be the ultimate evil but I am constrained to speak the truth and say things as I see them. The fact that a war is coming is a testimony to the fact that we have all failed to manage the peace that God has given us since 1970 and the cessation of hostilities after our brutal civil war. We have failed so badly that the remote and immediate causes of that civil war are back with us today, even though we hate to admit or acknowledge it. The country is badly divided today and the people are suffering as never before. The division and hatred amongst some of our ethnic groups have reached pre-civil war levels. Consider the dangerous mix. A crumbling economy. An inept, weak, failing and paranoid government. A hungry, angry and increasingly desperate civilian population. An ignorant, obsessive, arrogant, insensitive, corrupt and self-absorbed political class who are out of touch with reality. The ruthless implementation of an ethnic and religious agenda by a reckless and irresponsible government that refuses to consider the implications of taking such a course of action and that have an early-1960’s mind-set. The growing unrest, ethnic killings and sectarian murders. An ethnic and religious division within the Armed Forces and security agencies. A relentless clamp-down on and persecution of the opposition and all dissenting voices by the government and the use of fear as a tool of governance and control. The entering into a secret and covert treaty and military alliance with a group of Arab Sunni Muslim countries that seek to Islamise our country, that have, over the years, funded the most brutal and barbaric jihadist and radical Islamist terrorist organisations all over the world and that seek to impugn our national integrity and violate the secularity of our state. The attempt to intimidate and control the judiciary and legislature by the executive, and so much more. The list goes on and on and history proves that such a mixture of circumstances is dangerous and can only lead to open conflict if not halted. If such a thing could have happened in the heart of Europe in the early 1990’s why on earth would any reasonably intelligent person dismiss the notion that it can happen here?… We must do all we can to avoid this. We must reach out to one another in love and understanding in this country in an attempt to prevent war and secure the peace. We must do our best to ensure that that division and hatred does not spill over into open war. This is because war is a terrible thing which must be avoided at all costs. If anyone doubts that, they should consider the plight of the Bosnians of Bosnia-Herzogovina during the Yugoslavian civil war that took place in the European Balkans in the late 1980s right up until 1992. They were the only ethnic group in Yugoslavia that was not prepared for it when the war started. They had no arms, no plan, no allies and no fall back position. Plagued by a cowardly and weak-minded ruling elite and a naive, self-serving, servile, ignorant and intellectually-challenged middle class the Bosnians just kept talking, writing newspaper articles, appeasing the aggressors and their tormentors, praying and hoping for peace whilst all the other ethnic and religious groups and warring parties were quietly preparing for war. They suffered immensely for their lack of understanding, insight and foresight and their civilian population paid a heavy price for this. 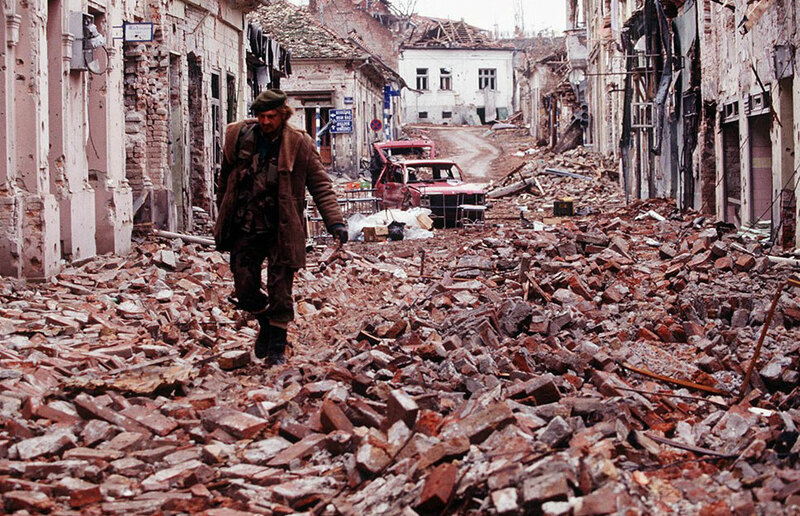 For two years after the civil war started the Bosnians could not even buy a gun or bullet to defend themselves. Their towns were besieged and blown up whilst their women and children were raped, enslaved and butchered. Yet sadly the signs of a future conflict are already there. I pray that I am wrong but as far as I am concerned, for Nigeria, the bell is tolling. May the Lord deliver us. Their men were rounded up into Second World War-like Nazi concentration camps and starved and tortured to death and their dignity and self-respect was taken from them. They were turned into an internally-displaced people and their land was transformed into a sea of desperate and suffering refugees. It was during that war that the term “ethnic cleansing” was first used by CNN to describe what was being done by the Serbs to the Bosnians, the Croats, the Slovenians, the Kosovars, the Macedonians and the Monte Negrans, all of whom represented the other ethnic groups that made up the old Yugoslavia. Eventually the country broke up and each of them got their independence from the dominant Serbs and from one another. If such a thing could have happened in the heart of Europe in the early 1990’s why on earth would any reasonably intelligent person dismiss the notion that it can happen here? The only difference would be that if such a thing were to ever unfold in our country it would be far worse than what happened in Yugoslavia due to the sheer size of our population. We must do all we can to avoid this. We must reach out to one another in love and understanding in this country in an attempt to prevent war and secure the peace.